Celebrities are THE fashion icons for beauty, makeup — and of course, hairstyles. Renee Zellweger is no exception. 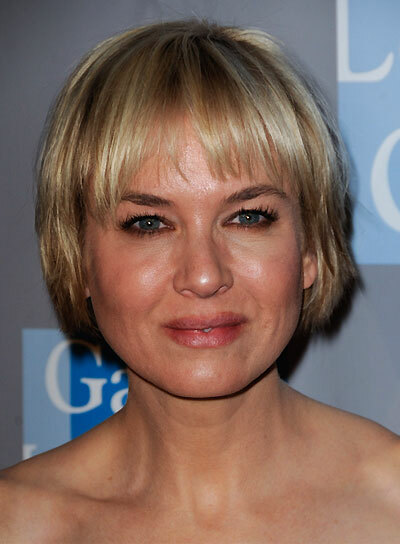 That’s why we’ve got Renee Zellweger photo galleries, pictures, and general beauty news on this celeb. Her style is totally inspiring and worth checking out. So if you’re searching for some beauty tips, hairstyle options, and fashion advice, turn to Renee Zellweger. She’ll bring your fashion to a whole new place. Got straight hair? Go for Renee Zellweger's simple updo when you're trying to get ready fast. To get the look: 1. If you have bangs, part them to the side with a wet comb.2. Comb the rest of your hair back into a semi-high ponytail. Secure with a clear elastic.3. Twist the ponytail into a bun and secure with bobby pins.4. Hairspray any flyaways into submission and yay, you're done.5. Bonus step: For a whimsical touch, add a thin headband.